You see that the list is quite exhaustive. Now, I was trying to find as many as possible last night using Google for a little project of mine. The question is, how do you go about finding them. How about searching for “phpinfo” in Google… You will get some results but you will also get many results from people talking about phpinfo. So while I was searching it suddenly hit me! … How does Google find pages? It crawls them 🙂 So every search result that you see is a result of crawler finding it. That’s a very good piece of information when you combine it with the fact that among the various information that a phpinfo() page gives, is details about the current client visiting, such as his IP address, his hostname, port number and so on. What do you get as a result? The perfect recipe! 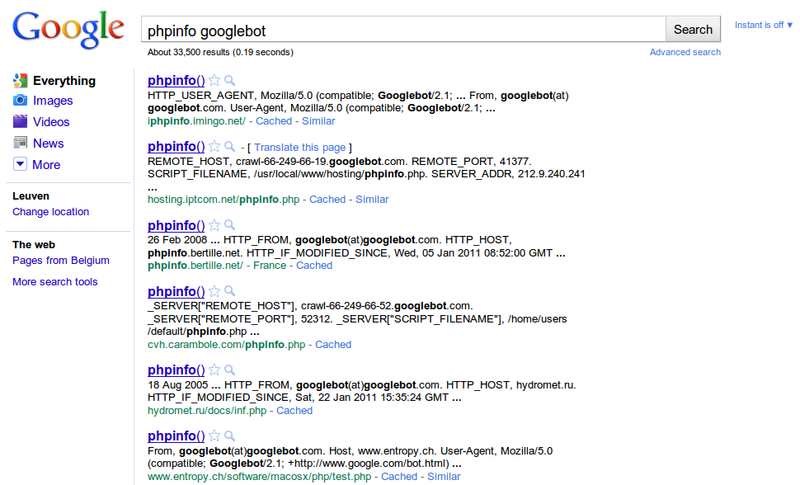 Go to google and search for “phpinfo googlebot”.